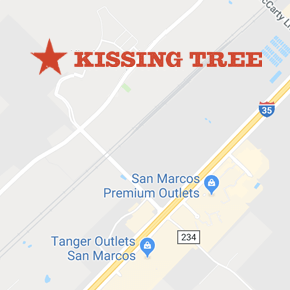 Kissing Tree is a distinctly Texan 55+ community, perfectly placed on the banks of the Texas Hill Country. Kissing Tree was designed to change the way baby boomers envision retirement, with a unique collection of indoor and outdoor amenities, including The Mix—the community’s social focal point; an 18-hole golf course and 18-hole putting course; and hundreds of acres of parks, trails and green space. Discover more about our one-of-a-kind amenities. How many homes will be in the community? Kissing Tree is a master planned community with an estimated 3,200 homes at the completion of the project. We currently offer 10 floor plans and five architecturally distinct exteriors which work together to create an eclectic and diverse community streetscape. The community will have several different neighborhoods with each section including approximately 150 homes. We anticipate the community will develop over approximately 12 to 15 years before completion. Does everyone who lives there have to be 55? Are non-adults (18 and younger) allowed to live at Kissing Tree? The primary occupant of the home is required to be 55 years old or older, however, the homes additional occupants may be 19 years or older. Guests 18 years old and younger are invited to stay at the community for 45 days out of the year. Within these 45 days, only 30 days may be a consecutive stay. What is there to do at Kissing Tree? Kissing Tree’s 20-acre amenity campus, The Mix, opened in 2017 with 8 pickleball courts, 6 bocceball courts, horseshoe pits, golf driving range, short game practice area, putting greens, hiking and biking trails and much more. Independence Hall is the community’s social building which includes a demonstration kitchen, community classroom, billiards, indoor and outdoor bar, live-music stage, food truck, fire pits and a biergarten. Golfers, both novices and seasoned, can play the 18-hole putting course and semi-private 18-hole golf course, which has been featured in 55Places.com, Golf Course Architecture, The Dallas Morning News, Golf Course Industry Magazine and the Houston Chronicle. An on-site activities director facilitates more than 100 clubs, and a variety of events and activities for residents. Once complete, homeowners will also enjoy a fitness center, indoor pool, outdoor resort-style pool, and a golf clubhouse and restaurant. Will there be sidewalks? Proper street lighting? There are no sidewalks in the residential areas and streets. The main boulevards will have sidewalk and bike/cart lanes in the street. The community allows for dark skies so that you can see the big Texas stars at night. This is created by providing bollard lighting on many of the trails, however, street lights are limited to the main boulevards and intersections. How much space is designated as natural/nature spaces? There will be 18 miles of scenic hike and bike trails. The trails will eventually intersect with the Purgatory Creek trail system in Hays County. The dynamic system will give residents access to the current Purgatory trail which leads all the way into downtown San Marcos and beyond. The Purgatory trail system is public, however, trails leading into resident areas will be marked as Kissing Tree resident only trails. Where is the closest medical facility? State-of-the-art medical providers are located a short distance away including Central Texas Medical Center, Live Oak Walk-in Care, Seton Medical Center Hays, Christus Santa Rosa Hospital, and Resolute Health Hospital. Will the houses have fences? Any restrictions on fencing front or back yards? Yes, Kissing Tree Villages will have their own fencing guidelines. Fencing guidelines, along with exterior design guidelines may be found in the community’s governing documents. Final submittals will be reviewed by the HOA architecture committee. Do you have to use specific lenders? While you may use the lender of your choice, below are some we have worked with and prefer at Kissing Tree. Find out more at www.kissingtreehoa.com. The HOA fees are currently $210 per month and include access to the The Mix, 24/7 guarded security, landscape maintenance of common areas, staff and maintenance of the facility. Although we do not anticipate the monthly assessment to increase more than what inflation dictates, it is not a fixed rate. What are the fees/dues for activities? How is it billed? Activities are programed through our HOA with the direction of our residents and Lifestyle Director, Kevin Wilson. Many activities are free to residents, and program are often resident-led with no fee. Specific activities can be organized by the HOA and additional expenses will be covered by a ticket price for the event. Lifestyle events will be billed through a resident-only online portal and payment can be taken at the front desk of the social building. The Kissing Tree Golf Club is semi-private with priority tee times and discounted rates provided toresidents. The course is now open to the public with discounts given to San Marcos residentsand those 55 and better. The golf green fees are not included with the purchase of the home or HOA fees. To learn more about golf fees, visit KissingTreeGolfClub.com.